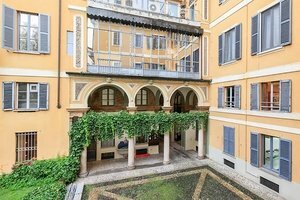 This beautiful showroom is located in the center of Milan’s Fashion District. It is ideal for Showrooms, Fashion Events and Corporate Events. This showroom is located in a colorful yet stylish building that includes a lovely courtyard, which is viewable from the space. 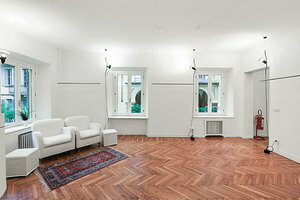 The interior features distinctive parquet floors, white walls and ceilings and hanging pendant lights. With extensive amenities including minimalist garment racks hanging from the ceiling, furniture, fitting rooms and many others, this space is perfect for a fashion showroom. 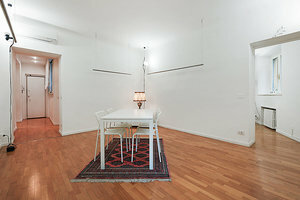 Situated in the center of Milan’s most fashionable neighborhood near several popular retailers such as Longchamp and Chanel, this space is well-located and an incredible opportunity for brands and designers looking to connect with customers and clients with a curated pop-up event.